Posted 2013-01-16, 04:24 PM in reply to KagomJack's post "Addicted to the Bang: The Neuroscience..."
I haven't gotten around to reading your entire post yet, but I did read this much and I have to address it. It seems pretty obvious that gun control would reduce the number of gun deaths (less guns=less gun deaths). However, that doesn't really help anything if the number of other deaths increases. The net result is the same. 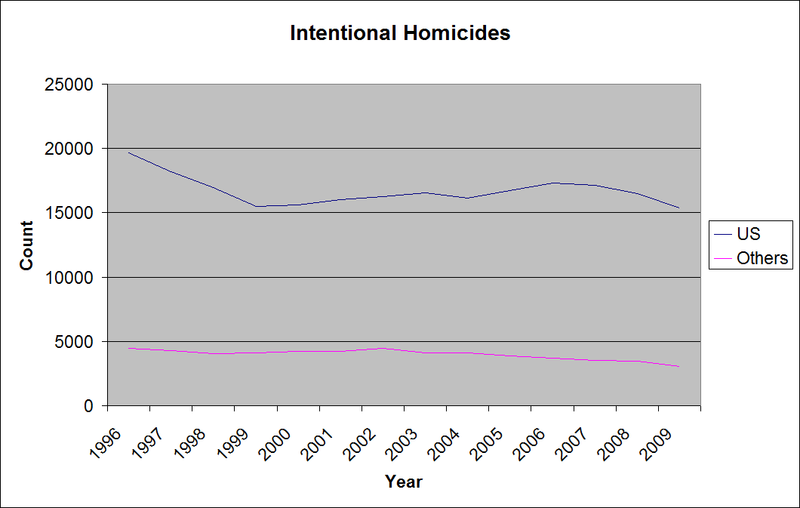 For the sake of ease, I'm going to use statistics for intentional homicide rather than deaths in general, and I don't think this will necessarily detract from the point. According to the quote above, those countries had 0.35% of the gun deaths that our country had, which is a fact that I'm not necessarily disputing. It could in fact be wrong, but I haven't investigated this. For the purposes of my point, I'm assuming that the quoted statistic is right, and I'm attempting to show how it is misleading. Also, I will cite my source at the end of this post. I took the liberty of plotting the raw number if intentional homicides in our country along with the countries listed in the quote between the years of 1996-2009 (the available data). You can see this graph below. 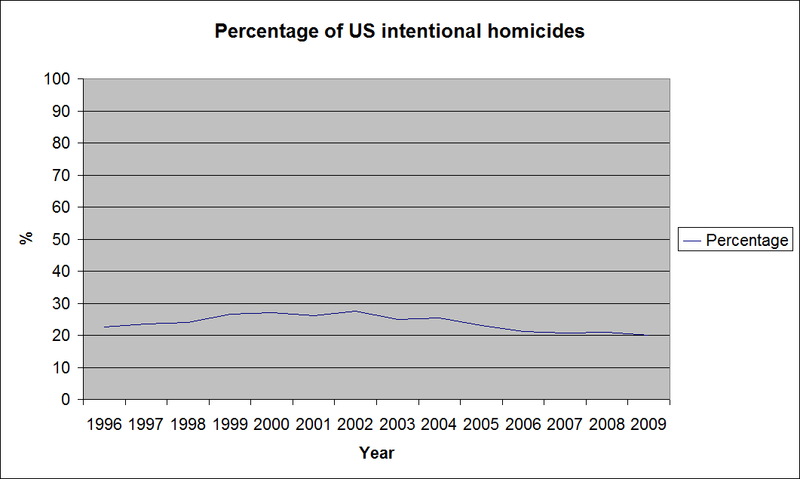 If you calculate the percentage of our intentional homicides that those countries had, this is the result for those years. As you can see, it's around 25% (closer to 20% now). Still a pretty clear difference, but not nearly as extreme as the initial quote implies to someone who isn't paying attention to detail. Posted 2013-01-16, 09:30 PM in reply to !King_Amazon! 's post starting "I haven't gotten around to reading your..."
It's like I always say, take away their guns, and the crazies will build bombs. And it's pretty hard to take away the bombs, considering how many household items can be explosive. Heck, plain old flour can be explosive under the right conditions. Posted 2013-01-17, 01:52 AM in reply to WetWired's post starting "It's like I always say, take away their..."
While what you are saying is true, it is also true that those countries that have gun control (from the list in the original quote) also have 1/5th the number of intentional homicides. A pretty solid argument for starting some gun control, or at least figuring out what those countries are doing right that we are doing wrong. It should be pretty obvious, though. Posted 2013-01-17, 08:51 PM in reply to !King_Amazon! 's post starting "While what you are saying is true, it..."
Posted 2013-01-18, 09:39 AM in reply to WetWired's post starting "I wonder how those statistics hold if..."
And a culture centered on violence. Forgot that. Posted 2013-01-18, 11:41 AM in reply to !King_Amazon! 's post starting "You can use the link I provided to find..."
Entitlement by itself doesn't breed violence, it's when you're willing to go against authority to take what you believe is yours that it turns into violence. Posted 2013-01-18, 04:11 PM in reply to WetWired's post starting "Entitlement by itself doesn't breed..."
This seems like a blanket statement that implies that going against authority is bad, which seems like a pretty bad mindset. It doesn't surprise me to see it coming from you, though. Posted 2013-01-18, 06:12 PM in reply to !King_Amazon! 's post starting "This seems like a blanket statement..."
Then you're getting me wrong. Rebellion can be a good thing if you have a clear mind and a good reason.